Tune in to Homebrew with Maddy and Patty on Monday November 21 to hear an exclusive recording of No Fixed Address live From the Vault. PBS proudly presents this restored archival recording of legendary Aboriginal reggae-rock pioneers No Fixed Address to mark the 35th anniversary of the set and celebrate the band’s recent entry into the South Australian Music Hall of Fame. 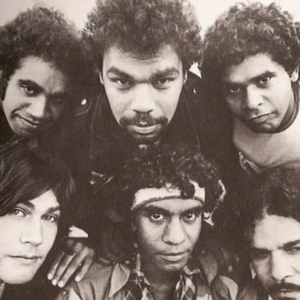 Formed in Adelaide in 1979, No Fixed Address blazed a trail alongside contemporaries Us Mob as the first recorded Aboriginal rock bands in Australia. Recorded at PBS’ first home, the Prince of Wales Hotel on November 2, 1981, this special archival recording captures the band after the release of Wrong Side of the Road, 1980 film documenting their experience as touring musicians and saw them enter the mainstream consciousness and reach international audiences. Their potent blend of rock and roots reggae carries messages about Aboriginal identity, police oppression and human rights that are as essential now as they were at the time of their creation. Tune into to hear highlights from this recording and an interview with No Fixed Address’ Bart Willoughby. From The Vault featured No Fixed Address on Homebrew – 3pm Monday November 21, only on PBS.